The following section details the framework used for post processing the data in the iScape project. 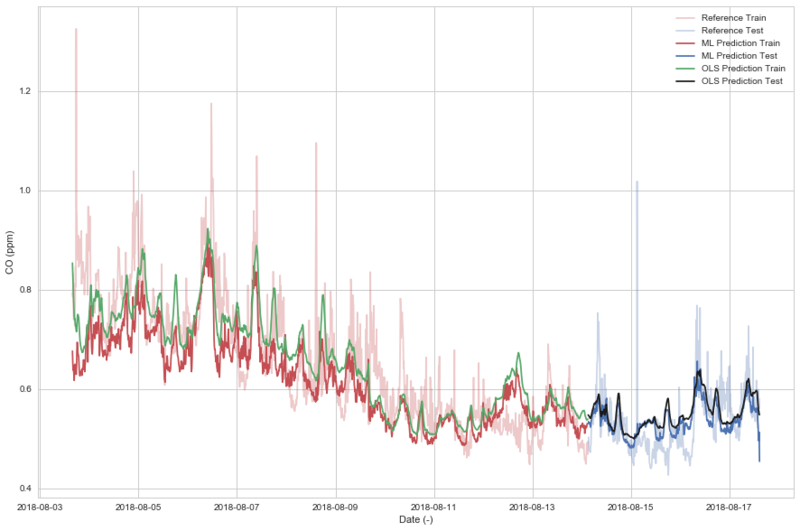 Based on Jupyter Notebooks and running Python and R, it is intended to provide an state-of-the-art data handling and analysis framework, which can be easily expanded for other use cases. 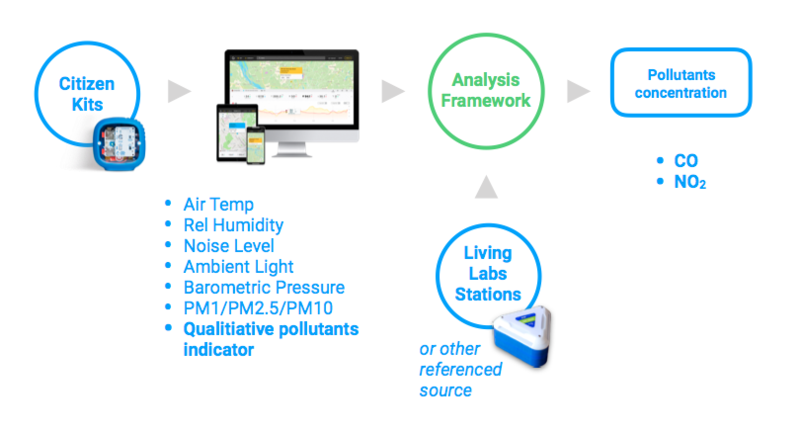 The Sensor Analysis Framework is mainly used to handle sensor data acquisition and apply sensor models for actual pollutant concentration calculations. In the following sections, we detail the principles of low cost sensor calibration that we follow, as well as the usage within the framework. All the files and notebooks related to this document can be found online in our Github repository. 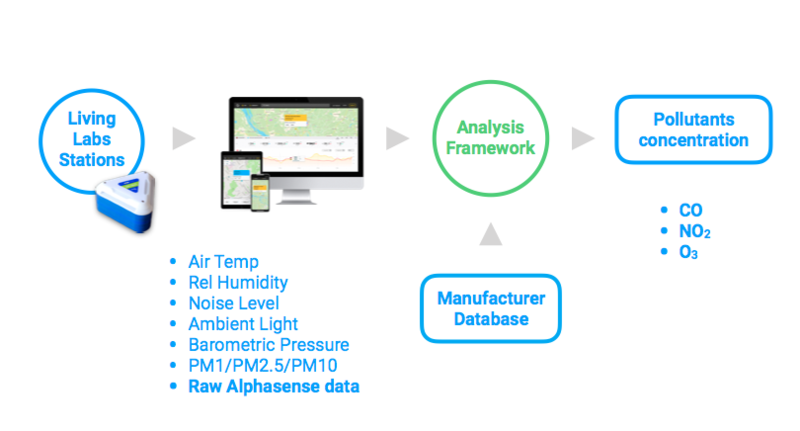 Generally, the sensor data is ingested in the Sensor Analysis Framework directly from the API, or by inserting it via csv. As detailed in the Low Cost Sensor Calibration Section, each of the sensors is treated differently, and some of them require more analysis than others, e.g. : the Metal Oxyde sensors vs the electrochemical sensors. Similarly, this approach can be used to improve the Living Labs Station's data, where known effects from temperature or humidity can be input as corrections for the models generated. Finally, all the models generated are stored and can be easily loaded from the Github Repository. Furthermore, within the sensor data analysis, a notebook and several scripts are included, intended for modeling and data visualisation, including exploratory data analysis and a testing environment for sensor model calibration. 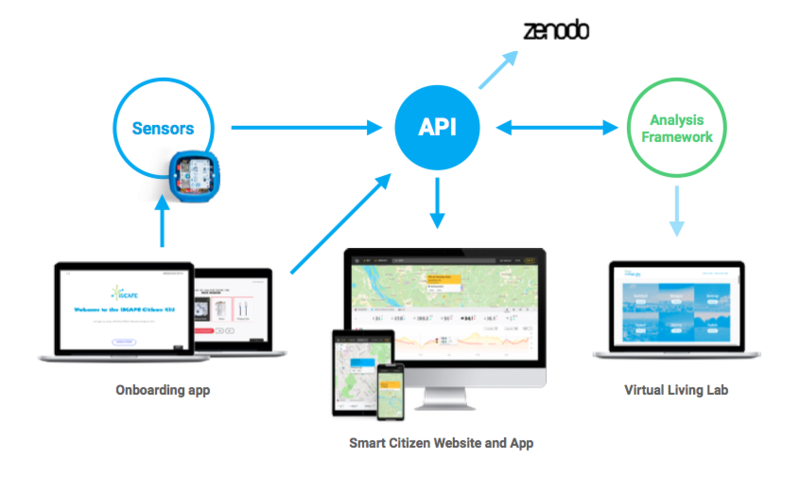 This includes interfacing with the SmartCitizen API in order to download available sensors from the platform, as well as local csv analysis. Further functionalities are explained in the following sections. The framework also provides several functionalities within signal analysis field using numpy and scipy frameworks. All this structure is filled up at the test creation with a dedicated script, saving future time to understand mismatching reading units, timestamps formats and so on. Finally, the devices' data is stored as Time Series data, with DateTime index in ISO8601 format. This is an important consideration for data visualisation and posterious modelling. Depending on the model selected, different validation techniques are implemented, in order to verify models' assumptions and avoid data misinterpretation (i.e. Durbin Watson or Jacque Bera test for linear regression). Finally, it is important to follow carefully the instructions as stated in the notebook, in order to avoid low model quality. Once the model is analysed and validated, it can be saved and exported. This allows using the model in the future with the same variables in other sensor studies. The model objects are serialised with joblib and can be uploaded to the Models Github Repository for later use.